Planet Amazing is working with horse farms all over the USA, England and New Zealand to treat horse cribbing in a non-toxic approach that does away with grazing muzzles. Horse cribbing is a serious problem that wounds and kills horses, and Planet Amazing has a new report that focuses on grazing muzzles - the cover that goes over the horses mouth to stop horse cribbing. What is horse cribbing? According to Wikipedia, "Horse cribbing (US) or crib biting (UK) involves the horse grabbing a solid object such as the stall door or fence rail with its incisors, then arching its neck, pulling against the object, and sucking in air. Cribbing and windsucking have been linked as a causal effect to colic and stomach ulcers. A similar behavior, wood-chewing, is another undesirable habit observed in horses, but it does not involve sucking in air; the horse simply gnaws on wood rails or boards as if they were food." Planet Amazing points out that the horse grazing muzzle which has been used for centuries to treat horse cribbing has its own problems and can be replaced with other solutions. Planet Amazing says their horse cribbing solution BitterLicks is a non-toxic cure for horse cribbing that can eliminate the need for horse muzzles in many horses. While it does not work 100% of the time, it has worked in many horse farms to completely cure the horse cribbing vice in horses, thus allowing them to live a life without a grazing muzzle. Called "BitterLicks," the horse cribbing treatment is made from the most bitter-tasting substance on the earth and is completely safe for horses. According to Justin Douglas of Planet Amazing, "BitterLicks can save a horse's life because it causes most horses to stop cribbing. Cribbing is a bad habit some horses develop where they chew wood, leading to problems with gums, teeth, and other horse health problems." 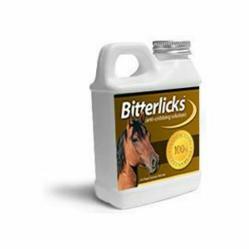 To order Bitterlicks horse cribbing solution, visit their BitterLicks Horse Cribbing Cure page at Amazon.com.